ADD BUD is a plant flower enhancer with its unique chelating properties that promotes amio & catio exchange, cellular and microbial activity. It helps to stabilize nutrient against strong pH changes from poor nutrient quality and maintenance. 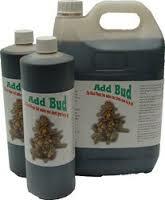 ADD BUD is a fine blend of hormones, vitamins and crucial minerals.